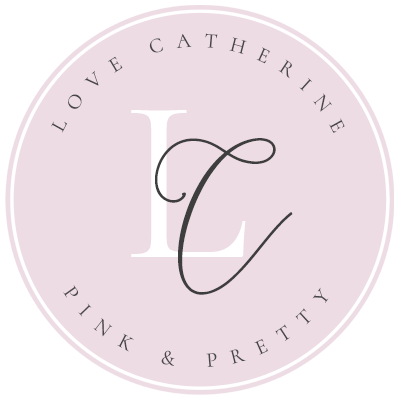 Hello princesses, I know we are well into Autumn now so I’m aware this post is a little overdue eek! If you’ve been following me over on my social media then you will know I’ve had amazing start to Autumn in none other than Disney World Florida (blog posts to come!) and I’ve been working around the clock since I’ve been home! 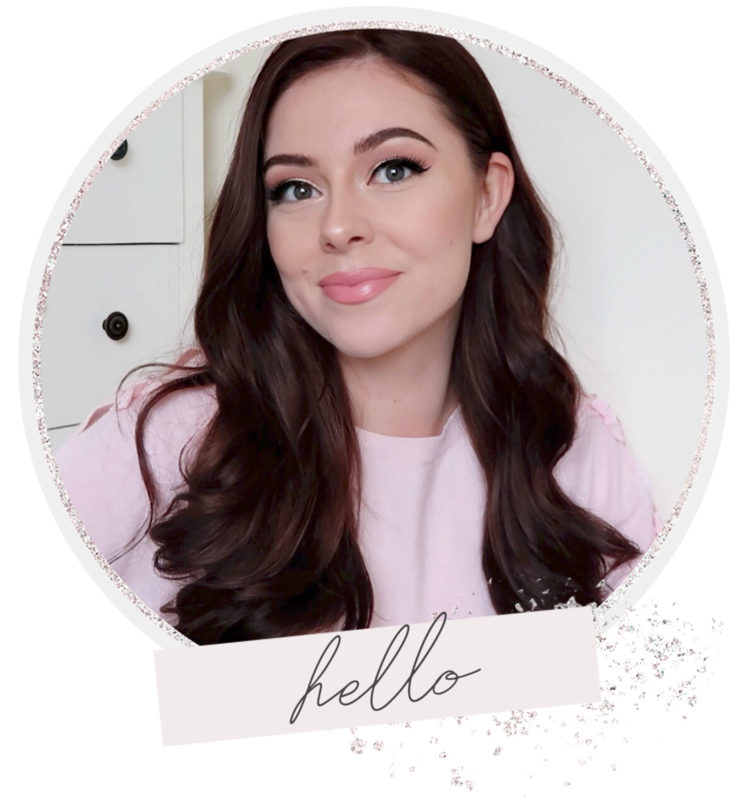 I still felt inspired to write and share a post about my favourite girly essentials for an enchanting and cosy Autumn, so I hope it still gives you a few cute little ideas and makes you feel like a warm and toasty cinnamon bun! Personally I don’t think there’s anything more relaxing than a room lit by the ambient glow of candlelight. It makes me feel so warm, calm and comforted, especially when the evenings get dark and there’s a chill in the air! 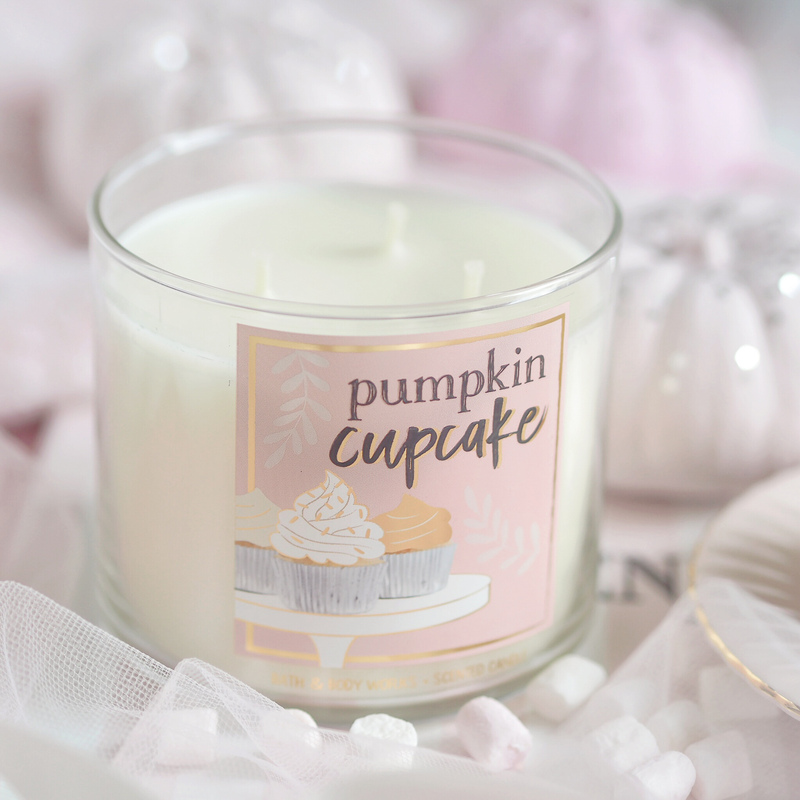 I bought this adorable Pumpkin Cupcake candle from Bath & Body Works and it’s just the cutest thing. 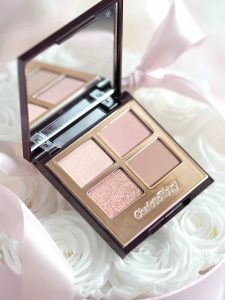 It smells like a fresh batch of cupcake batter mixed with a sprinkling of pumpkin spice! You can get this scent every year at B&BW, just in different packaging each time, but I love this year’s girly pink design so much I might just have to save it for girly Autumnal decor, which we all know is hard to come across! Some other candles that I promise I have actually been burning are the Yankee Candles in Autumn Glow which smells like a crisp woodland walk at sundown with a warming earthy undertone, as well as Warm Cashmere which is a lovely cosy and clean scent, both perfect for Autumn. 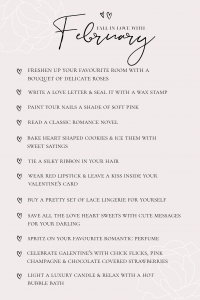 For me, candles just complete any cosy night; relax and unwind with a candle lit bubble bath or cosy up in bed with your favourite candle burning on your bedside table and read a few chapters of a new book. I love cosy evenings with candles flickering and the TV on, me and my boyfriend have been watching The Haunting of Hill House and it’s definitely up there with one of the best spooky series we’ve seen. It has a really gripping storyline, full of mystery and intrigue, which makes it impossible not to binge watch! There’s nothing like cosying up like a little burrowing bunny, under a mound of fluffy blankets with a warming drink in hand, when it’s cold and blustery outside your windows. 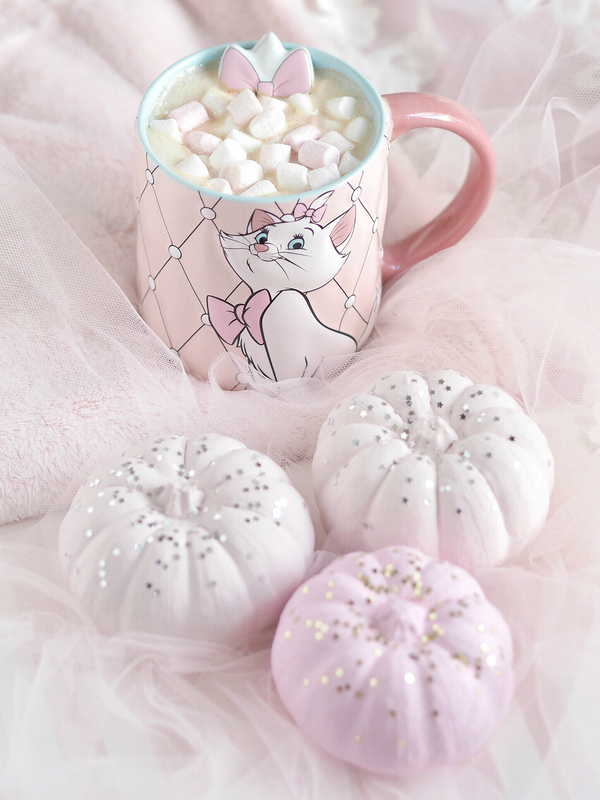 Indulging in a warm drink can make you feel toasty from head to toe, whether it be a pumpkin spice latte or a hot chocolate with extra whipped cream and mini marshmallows, it makes for a lovely little seasonal treat. Of course we all know I’m a happy girl with a hot chocolate in hand, but this time of year I also really like an occasional caramel latte or double chocolate mocha. You could even whip up your own batch of Homemade Pumpkin Spice Latte using this recipe from Passion For Baking. 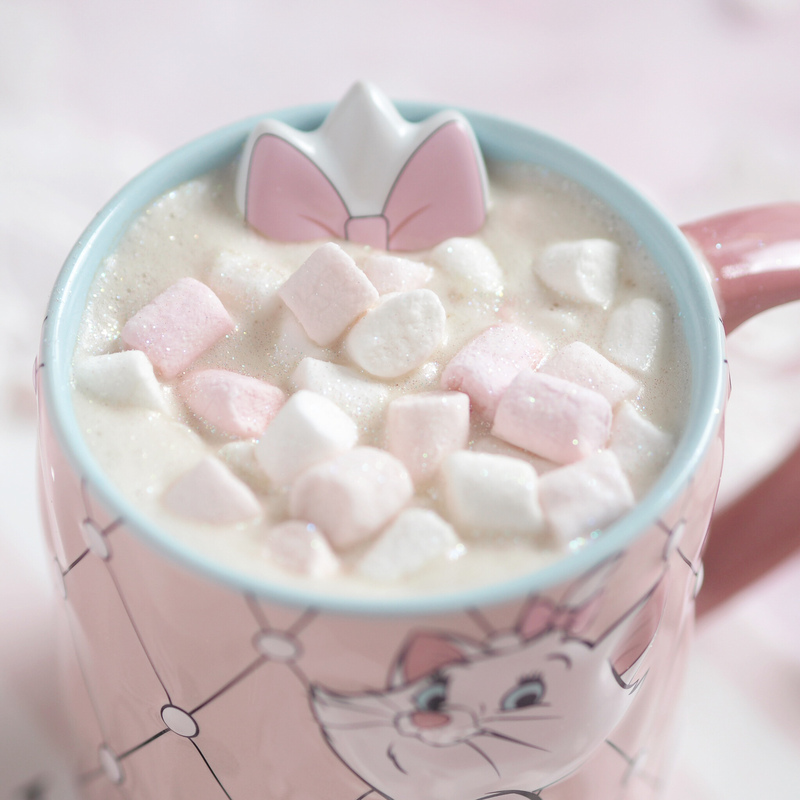 Don’t you find that there’s something about drinking from a pretty mug that makes it taste that little bit nicer… hey, at least I think so haha. 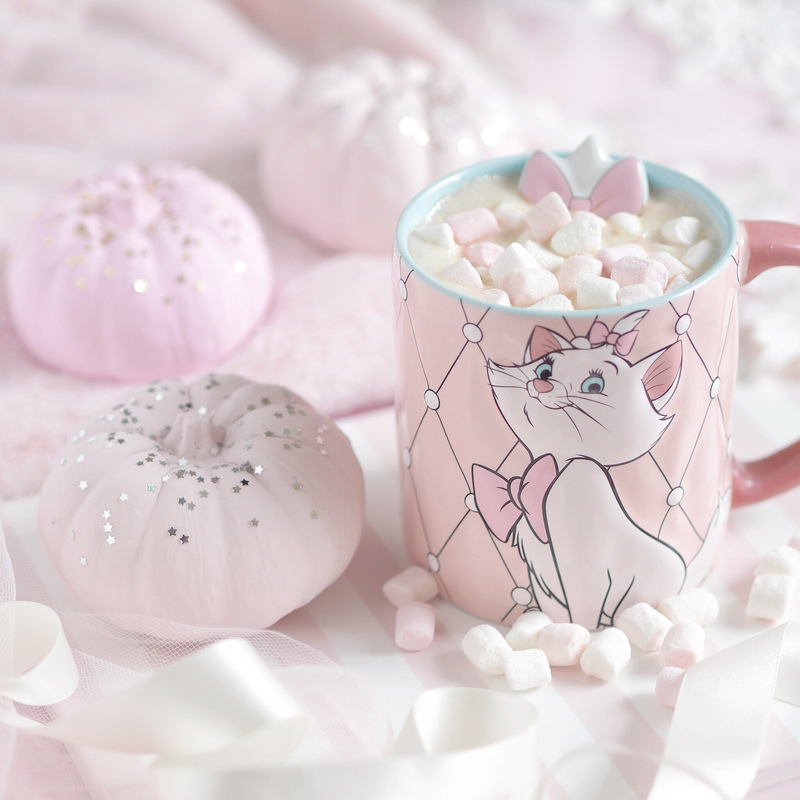 I got this adorable Disney Marie mug on holiday in Florida and I just about fell in love when I saw it, it has a beautiful pink quilted design with Marie perched in the centre like a little princess, and it comes with it’s own little ceramic spoon complete with a pretty pink bow. I’m not sure I could ever find another Disney mug to top this perfection but I’ll happily wait! As the weather turns crisp and fresh, and the leaves fall to the ground like golden snowflakes, it’s time to start wrapping up for the cold outside. 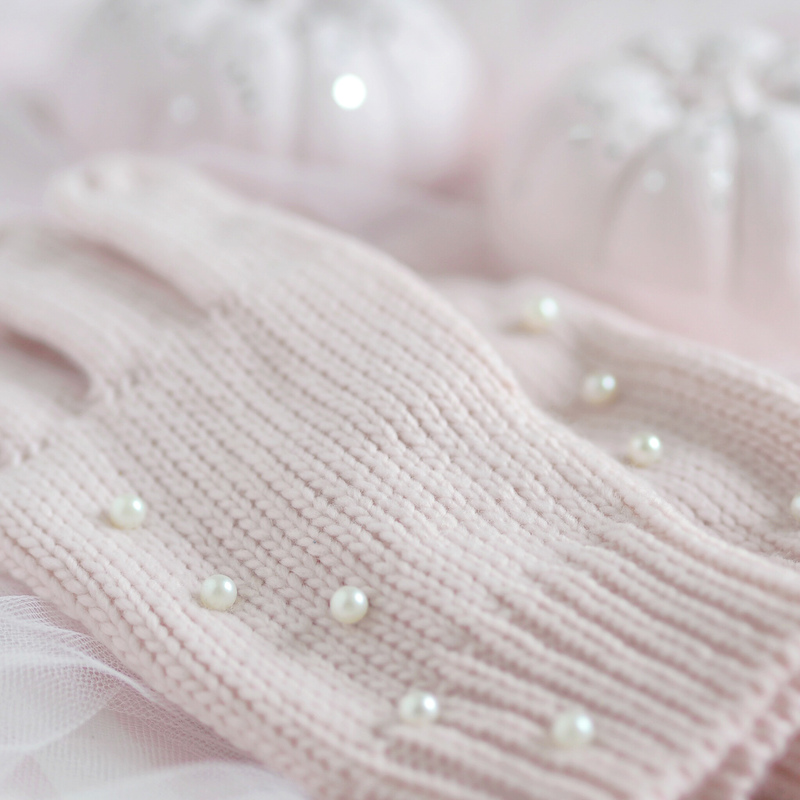 We’ve had some super chilly weather recently so it was perfect timing when I bought these beautiful Pink Pearl Gloves from Katie Loxton, I adore items that are adorned with pretty pearl details as I think they give such an elegant and feminine effect. 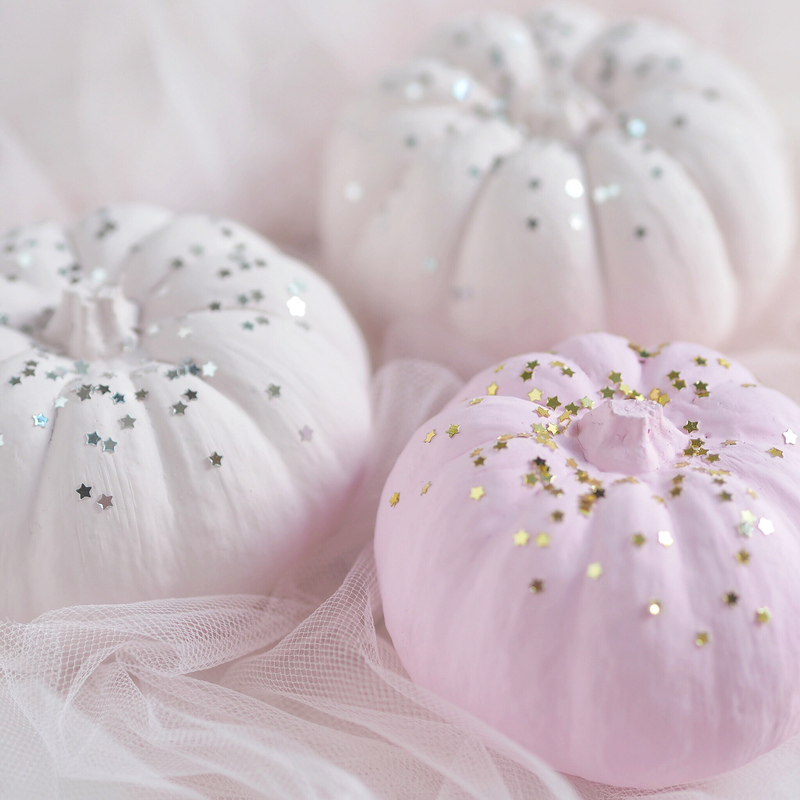 I will start wearing these more once Winter arrives but I do wish I’d worn them when I visited a pumpkin patch today! 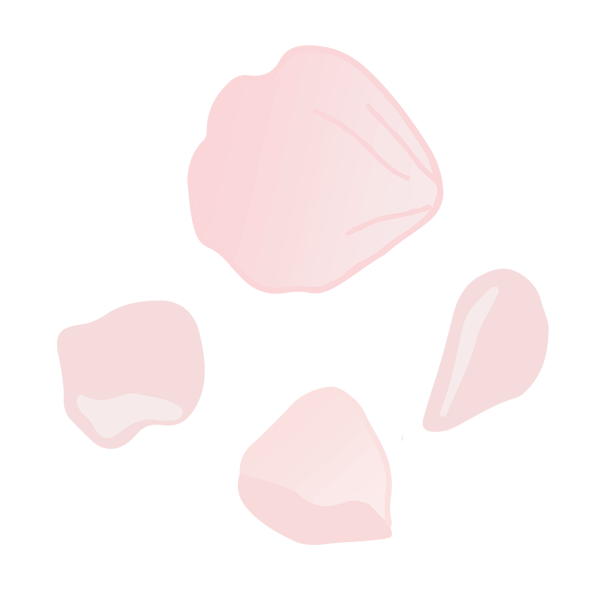 I did however wear my pretty new Pink Ruffled Scarf that I got in the sale on ASOS and I was definitely grateful for it! 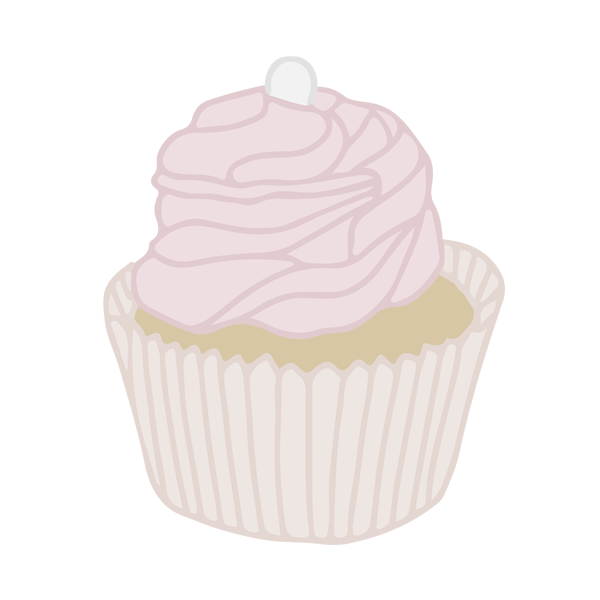 You know me, give me a theme to bake for, and I can’t help but make it pink and girly. This year I challenged myself to make Halloween, a traditionally spooky and scary holiday, into a cute, fun and pastel paradise! I came up with this pretty set of cupcakes that included a starry witches hat, a little bow adorned ghost and of course some little pink pumpkins. 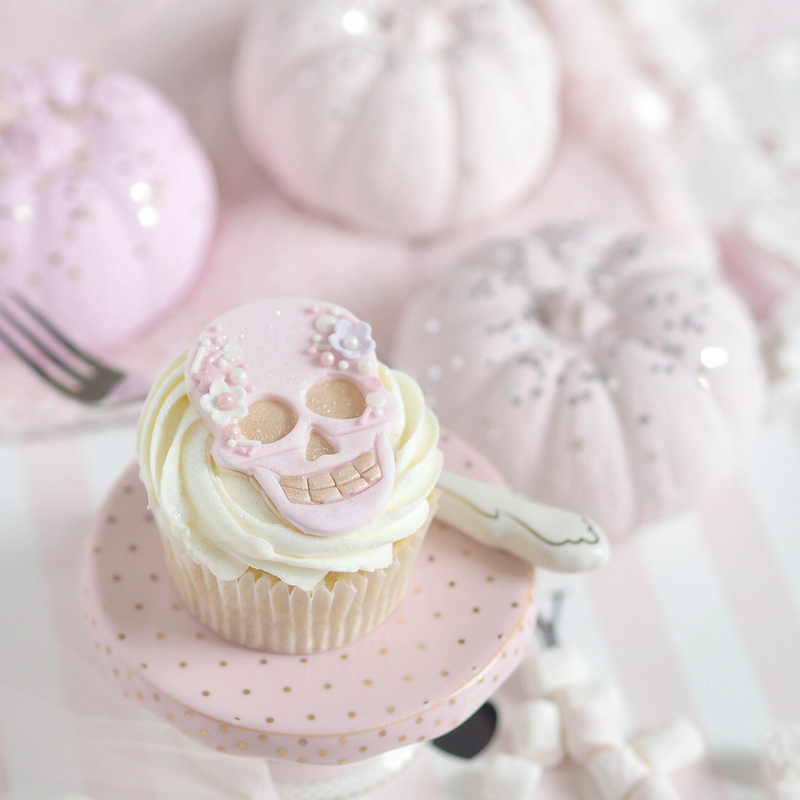 I also made a batch of bejewelled pastel skull cupcakes that I have a tutorial for here. Complete your cupcakes with swirls of pumpkin spice cream cheese frosting for an added Autumnal twist. Alternatively to cupcakes, freshly baked warm desserts are a perfect treat this time of year. Think warm apple crumbles, cinnamon buns, sweet pumpkin pies and toffee apples. 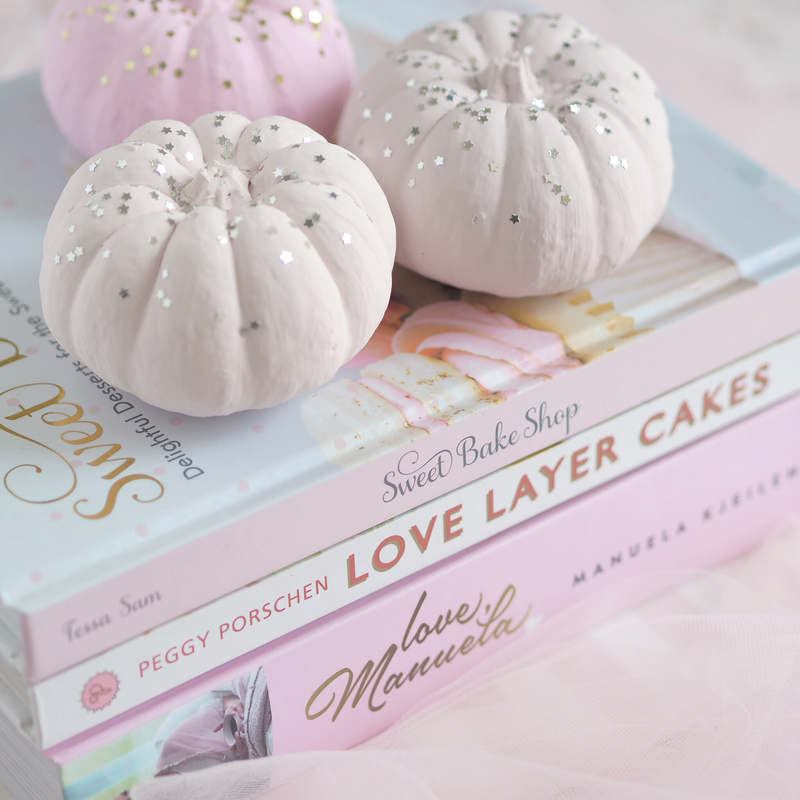 I’ve handpicked a few favourite recipes that I would love to try this Autumn that all have a cute girly twist to them including these Mini Pink Pumpkin Cakes and Cinnamon Buns from Passion For Baking. 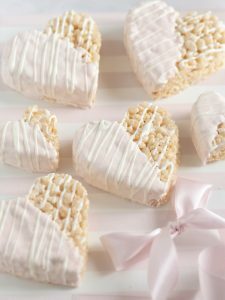 Aswell as these adorable Miniature Love Heart Apple Pies by Sophie from The Frosting Fairy, and this recipe for Pumpkin Spice Cupcakes from Sweet Bake Shop. Bundling up in snuggly pieces is definitely the upside to the drop in temperature. 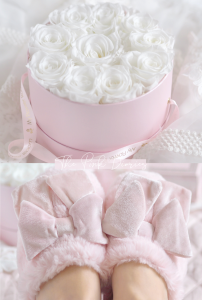 At the start of Autumn I came across some adorable Primark finds, including these cosy pink slippers which are so super soft and have a lovely little rose gold bow detail. 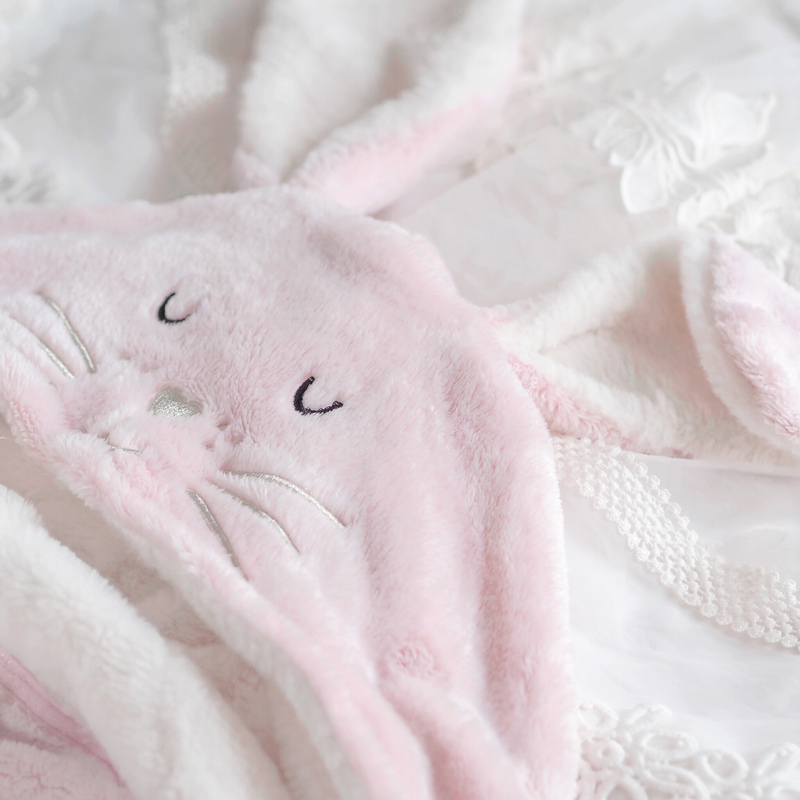 I also got this fluffy bunny dressing gown, which not only is the cutest robe I’ve ever seen, but it also has softest fabric ever! It makes me feel like I’m being cushioned by a big fluffy cloud and I just adore it! I hope the rest of your Autumn is magical and enchanting, complete with cosy evenings under fluffy blankets, indulgent pumpkin spiced lattes with all the extras, the smell of warm cinnamon apple crumbles baking in the oven and the flicker of autumnal candles burning after sundown. youre picture’s look always amazing! i have a lot to learn, to make beautyfull picture’s like you. I love nothing more than a really cosy night in!